You might want to stop or start enrichments as you refine or focus your cybersecurity monitoring. You can easily stop and start enrichments by using Ambari. Display the Ambari tool and navigate to Services > Metron > Summary. Click Metron Enrichments to display the Components window. This window displays a list of HCP hosts and which components reside on each host. Click the Started/Stopped button by Metron Enrichments to change the status of the Enrichments then click the Confirmation button to verify that you want to start or stop the enrichments. Ambari displays the Background Operation Running dialog box. Ambari displays the Stop Metron Enrichments dialog box. 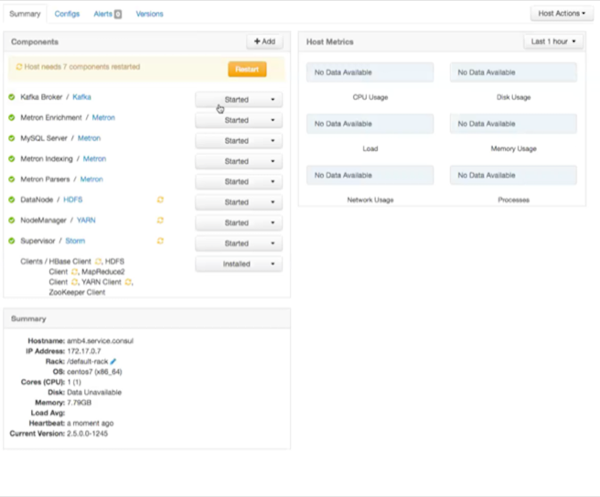 Click the entry for your Metron cluster, then click Metron Enrichments Stop again. Ambari displays a dialog box for your Metron cluster which lists the actions as is stops the enrichments.